Blackjack is the most popular table game in casinos. There might be more money spent playing other games but there are more blackjack games than any other. Gaming manufacturers are always looking to capture the love of blackjack with different variations of the game. Some variations of blackjack like Blackjack Switch stick around but others never see more than a trial period. There’s a new blackjack game hitting casinos around the country called Multiplier Blackjack. There are two different layouts for Multiplier Blackjack. One version of the game just features just the Multiplier Blackjack wager. The other version of the game allows bettors to play either or both regular blackjack and Multiplier Blackjack at the same time. 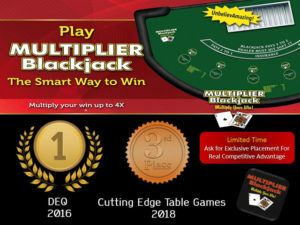 In the multi-game format of Multiplier Blackjack, players may choose to make a regular blackjack wager, a Multiplier Blackjack wager, or make a wager on both on each hand. Unlike some side bets or multi-wager games the bet sizes in Multiplier Blackjack can be whatever the player chooses so long as it’s within table limits. For example, a bettor can make a $5 wager on Multiplier Blackjack and a $25 wager on the traditional blackjack game. The regular blackjack game is a traditional blackjack wager. Wins pay even money while a natural blackjack pays 3:2 or 6:5 depending on the casino. Multiplier Blackjack is a bit more involved but not very complicated. Multiplier Blackjack players are paid traditionally except for when the dealer busts. Players seem to like this game because they can get paid up to four times the bet when the dealer busts. The dealer bust multiplier is different than blackjack games with busting side bets like Buster Blackjack since you’re playing a full hand. Here are the multipliers for dealer busts. If the card that makes the dealer bust is a 10 the bet is a push. If the card that makes the dealer bust is a Jack, Queen or King the bet pays 1:2. If the card that makes the dealer bust is an 8 or 9 the bet pays 3:2. If the card that makes the dealer bust is a 7 the bet pays 3:1. If the card that makes the dealer bust is a 6 the bet pays 4:1. Most of the blackjack rules are for Multiplier Blackjack are dictated by the casino. However, we do know that when playing the multiple bet version of Multiplier Blackjack players may double or split on one or both hands. According to Wizard of Odds, the house edge for Multiplier Blackjack is 2.04%. This assumes a fair game that pays 3 to 2 for blackjack, allows doubling after a split and re-splitting aces allowed while the dealer hits soft 17. Nothing will replace traditional blackjack with player-friendly rules and limits. Multiplier Blackjack offers a decent house edge for a new game in casinos today.